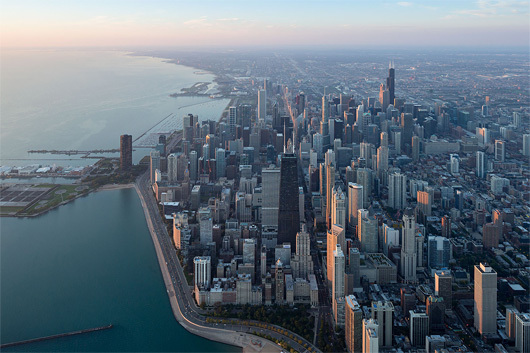 The Chicago Architecture Biennial announces the Lakefront Kiosk Competition, organized in partnership with the Chicago Park District and the City of Chicago. In keeping with the mission of the Chicago Architecture Biennial, the Lakefront Kiosk Competition is an opportunity to support innovative architectural work and to use the city—more specifically, the iconic shoreline of Lake Michigan—as a laboratory for architectural experimentation. The competition calls for the inventive design of a new kiosk that will be installed on Chicago’s lakefront, one of the city’s most vibrant public spaces. The winning entry will be part of a broader initiative, envisioned by Mayor Rahm Emanuel and the Chicago Park District, to enhance cultural life on the lakefront. A jury of architects, curators, and city representatives will select one winner to receive the BP Prize. The winner will be awarded an honorarium for design development and a construction budget. The winning competition entry will be constructed and displayed in Millennium Park during the Chicago Architecture Biennial (October 2015-January 2016) as a featured component of its exhibition program, and in the spring of 2016 the kiosk will be installed on the lakefront.